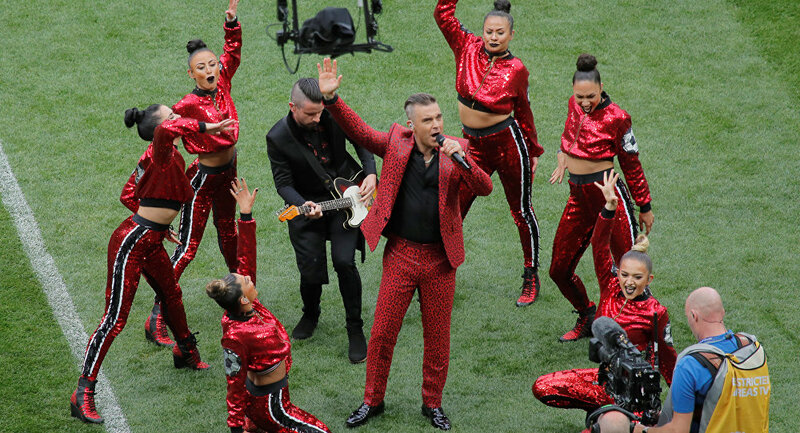 British pop legend Robbie Williams has caused controversy after giving the middle finger to a camera while performing at the World Cup opening ceremony in Russia, an event viewed by perhaps as many as one billion people round the world. Prior to the opening match between Saudi Arabia and Russia, the 44-year-old pop star wowed the 80,000-strong crowd at Moscow's Luzhniki Stadium with a rousing rendition of his 1998 smash hit ‘Let Me Entertain You', bedecked in a red leopard-print suit. After the performance, he was joined on-stage for a duet of ‘Angels' with opera singer Aida Garifullina — but as he closed out the ceremony with number one hit 'Rock DJ', he ‘flipped the bird' to viewers. Many duly flocked to social media to voice their feelings on Williams' gesture — some hailed the singer, while others were offended. Absolutely disrespectful and coupled with a nonchalant performance. He won’t care though. He will still get paid millions for it. While the Russian Federation has passed laws on public obscenity in recent years, it's unlikely Williams will be disciplined by authorities — unless he attempts to duplicate the performance in the near future. In 2014, the Duma passed a ban on explicit language in public performance, which stipulates repeat offenders could face a 90-day cessation of activities for commercial enterprises. The law doesn't extend to profane gestures — but the pop impresario may still be wise to hold fire, if only to minimize the condemnation of certain Twitter users.